Today, an absolutely essential tool for exploration up the Lomami, or anywhere, is the GPS unit (Global Positioning System). 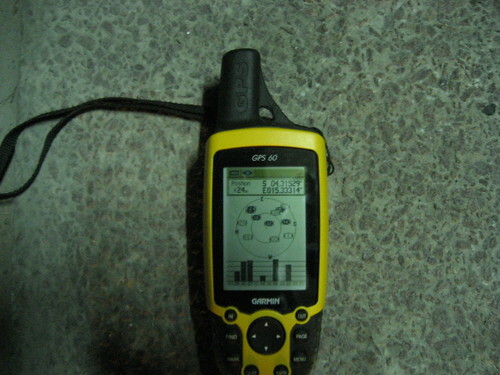 One of the GPS units used by Ashley’s teams is pictured below marking my decimal degrees here in Kinshasa. John, my husband and good friend, just told me (Skype) that with those two strings of numbers you see at the top of the unit, you (or anyone) could set your own GPS unit and compass so that you could navigate amazingly close to me here on Poids Lourd Ave, next to the docks on the Congo River. Karibu! I, myself, am just learning how to use one of these units, but already I cannot imagine how anyone could move around unknown forest or unknown waters without one. So it is pretty amazing what the geographer-missionary Rev. George Grenfell was able to do back in the 19th century with compass, sextant, theodolite and immense patience and determination. 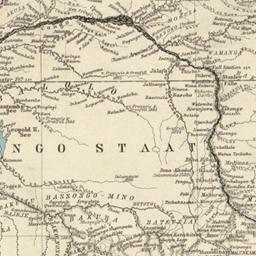 His map of 1886, copied below, traces his discovery of many of the Congo’s major tributaries including the Kasai, the Ubangi and the Lomami. 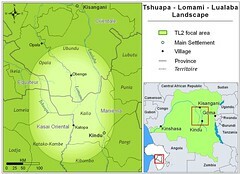 The source of the Lomami remained uncertain, however, as there was no record beyond 1 degree, 33 minutes south latitude which was as far as he went because, as he wrote, “the course of the Lomami was very torturous, and its current very strong.” As a result, the upper part of the Lomami, known from the southern savannas was mistakenly thought to be a completely different river system that dumped into the Sankuru River. Grenfell was a contemporary of H.M. Stanley who was the first explorer to follow the Congo River’s immense bend around to its outlet on the Atlantic. 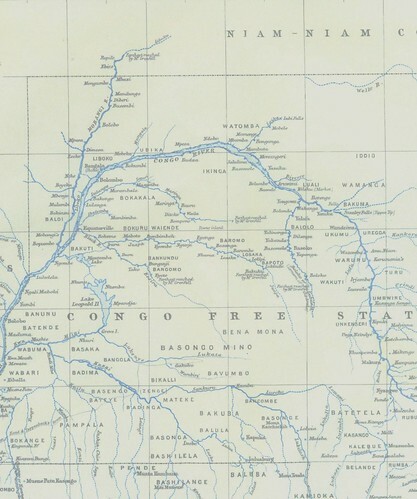 The discoveries of Grenfell and Stanley completely revised the map of central Africa, known only by outline 75 years earlier when people were plying the seas but not venturing into the interior. 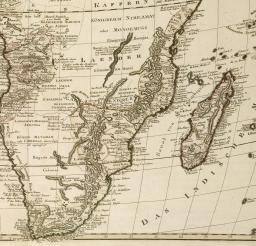 Map below from 1794. Ashley (taking a short vacation after three months on the Lomami) and John (who joins the Lomami teams at the end of October) are both so GPS-oriented that they must imagine their movements through the day in little fractions of decimal degree progression. I can just see Ashley jerking his way towards the underground in London (but soon here again and heading back upriver) and I can imagine John’s motorcycle jumping a bit between 10ths of decimal degrees past the money changers on the main drag of Beni (where he is finishing reports before packing his knapsack for the Lomami). But then the world hasn’t really changed at all, just how we understand it has changed. Bernard locating himself with GPS unit up the Lomami. Chryso taking notes. But Grenfell’s wire head dress did not keep out the mosquito vectors of malaria and Grenfell died of “blackwater fever”, still in Africa, in July 1906. This entry was written by Terese Hart, posted on 2007-09-26 at 11:24 pm, filed under History of TL2. Bookmark the permalink. Follow any comments here with the RSS feed for this post. Post a comment or leave a trackback: Trackback URL. Neat! I’ve never seen a GPS in action, but if it requires math then I’d be lost forever. Thanks for the history lesson, too. Fascinating. Math that’s a good thing….I can do that. Post something without a typo that’s hard. Thanks for the interesting post. Great Post, Mama T…Grenfell really remains the lesser-known explorer–over shadowed by his iconized contemporary, Henry Morton Stanley. Yet Grenfell’s discoveries are of impeccable scientific and technical quality….And he managed to move across the forest without the loss of life and bitter destruction that accompanied Stanley’s more politically oriented missions. Grenfell the forgotten explorer of the forgotten landscape. In modern times exist good tools also for “home explorers” like me. I regularly followed ashley up the lomami( by google earth ). With a little bit experience you can distinguish swamp from primary forests secondary forests from savannahs …. 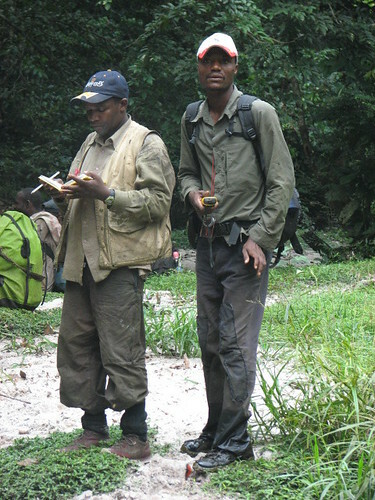 And professional scientists are even able to figure out good bonobo forest types in the satellite maps. But i don’t think that anybody can recognize the different tree species by satellite photos.